Wish it felt like football season? Smell no further. 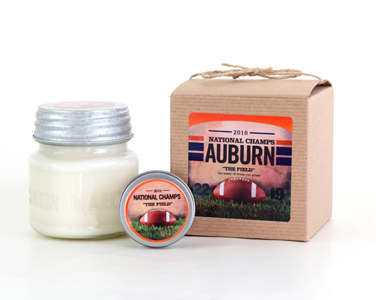 AuburnArt.com has come out with an exclusive candle it claims smells like “the fresh cut grass” of a football field. But not just any football field–Pat Dye Field at Jordan-Hare Stadium… the way it smelled during Auburn’s national championship season. Next challenge: Eau de Cam. Related: Auburn grad selling Toomer’s toilet paper roll inspired scarves for $17.16.